The Aristocrat label (“The Aristocrat of Records”) was founded by Charles and Evelyn Aron in c. April, 1947 (Chicago, IL). Phil and Leonard Chess acquired Evelyn Aron’s interest c. late 1949. In around May 1950 the label name changed to Chess. The label’s output varied from pop and jazz to blues and gospel. Aristocrat 902 (Seven Melody Men) was re-released on Chess 1475 as by the Four-A-Melody Men. This alternate name was also stamped on some copies of #902, under the Seven Melody Men name. Aristocrat 904 (Rev. Gatemouth Moore) was re-released on Chess 1437. Actually, the existence of #904 needs to be confirmed. Aristocrat 3500 (Blue Jay Singers) was also released on Gotham 600 and Harlem 1027. There’s an acetate by the Norfolk Singers of Chicago (Precious Lord b/w Let Jesus Lead You); this could be the Aristocrat group. 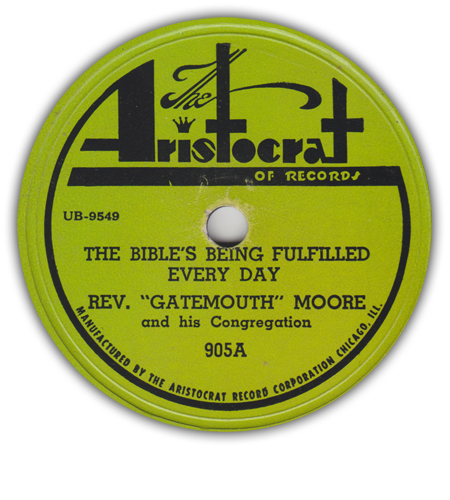 This page lists all known Aristocrat gospel issues (all in the 78rpm format).